You vetted the prospects and screened them for all the red flags you can imagine. You liked them, liked their project, and you ultimately decided to take them on as clients. But what if they’re walking into the relationship thinking their Lexus-type budget for the project will get them an Aston Martin kind of house, with burnished-looking Venetian plaster walls, gleaming Calacatta marble counters, and bleached, wire-brushed hardwood floors—while you bid them for drywall with four coats of finish, granite, and flooring with one coat of stain and three coats of polyurethane? If customers are expecting a higher level of product that is far above what the builder, based on the client’s budget, delivers, the mismatch will result in a bad experience for the buyers and unfavorable reviews for the builder. To learn more about novel ways other custom home builders manage their customers' expectations, check out "Keep Their Dream House From Becoming Your Nightmare"
How do veteran builders avoid taking on the crazies? see "Vetting Your Clients"
For recommendations about how builders can get a firmer hold on the reins of the builder/client relationship, look at "The Customer Really Wants You to Be Right"
Setting expectations is an important early phase in what will be a journey of several months to a year— or longer—constructing the client’s dream house. Doing so can create the best possible home construction experience, where clients are engaged, conflicts are minimized and resolved, and builders ultimately delight their customers by meeting and even exceeding expectations. Building a dream home should be fun for customers, but the experience can get bogged down by the process of making all of the product selections and myriad other decisions that can pile up, confuse, and, ultimately, end up preventing the builder and client from being on the same page. One way to keep both parties in sync is to be visual. Even better, Farinelli says, is to have clients see homes he previously built. John Ricci, president of Ricci Construction Group, in Cheshire, Conn., uses the site walk with clients to not only stake out where the septic, utilities, and sports courts are to be located, but to keep clients excited about what living in their dream home will be like. He’ll talk about how the driveway will be sloped so they can get the best view when they approach the house. He’ll explain how the home will be positioned so the west wind will prevent mold spores from collecting in the structure and how he can deliver for the client who sleeps on the right side of the bed and wants the winter moon shining on her face as she slumbers. Along with getting his customers excited about their home, Ricci also uses site visits and preconstruction sessions to explain things such as what he’ll do to guarantee a dry basement; how he’ll protect the homeowner’s health by exhausting radon; and why having separate propane lines for the heat/stove and for the generator is a best practice. Clients’ lack of experience and familiarity with the process of building their first house could manifest itself in discontent down the road if they become overwhelmed by all of the decision-making or wonder why custom home construction takes longer than a production-built house. Reminding clients early on that you’re on their side during this long process is part of setting expectations at Carnegie Homes & Construction, in Houston. During preconstruction, Carnegie clients are given a 15-page manual that outlines what happens during each phase of the project and what is expected of them at each stage regarding selections and deadlines. So as not to overwhelm clients, Carnegie breaks up the preconstruction process into several meetings, the first being the introductory session to go over the manual. “Just like studying for med school, you have to break up studying into multiple sessions because you can’t absorb it all at once,” says Gupta, who changed careers from medical school to home building. Clients get a preview of the subject matter that will be covered at the next meeting and are provided material so they can prepare for that session, which takes place a week or two later. Some builders urge clients to have all of their selections completed before the foundation is poured, but Gupta believes buyers can be overwhelmed by that approach. Instead, Carnegie handles selections in phases, with one group of features picked before pouring the foundation, another group finalized before framing, and another chosen by the time the drywall arrives. Anthony DeRosa started a custom home building company in 2008 with a staff composed of just himself and his business partner, both running jobs in the field and managing the office. They were very busy, but the setup worked because clients back then merely signed off on documents and let the architect take care of the details. “It was the nature of things because the meetings were shorter and much easier to navigate,” DeRosa says. Today clients are more involved. The Internet is an easily accessible well of images and information about new-home construction, architecture, and décor. When buyers see a Pinterest post of a family room, an alcove, or a stairway they like, they demand it. Also, the number of vendors and suppliers for tile, plumbing fixtures, and cabinets has exploded from the handful of outlets and showrooms that existed when DeRosa started building homes, so clients now have more opportunity to see what potentially can be in their dream home and be more hands-on with planning. Consequently, DeRosa Builders, Anthony’s second and current company, which he co-owns with his brother, Michael, in Greenwich, Conn., staffed up to meet clients’ needs. Another upgrade involved implementing CoConstruct. The project management software includes a tutorial so that even clients can use it. Clients receive weekly text message reminders about approaching deadlines and the schedule status. They’ll see the schedule pushed out when rain days occur and receive an alert when the antique finish porcelain bathroom tile they selected is delivered to the jobsite. To approve change orders, they simply sign on their smartphone screen with their finger, and the additional cost is added to the bottom line total for the project. Look books are part of the process at Hemingway Construction, but clients also are asked to bring images of what they don’t like. Peter Sciarretta, CEO of the Greenwich, Conn., builder, finds that customers often have an easier time articulating what does not appeal to them than they do explaining why they like something. An image of a kitchen or a façade may look great because the lighting was good, but their opinion of that photo doesn’t really reveal details about their preferences for architecture and décor. “The photos of what they don’t like tell me more about what they actually like than does a photo of what they like,” Sciarretta says. Another method he uses to discover clients’ expectations is asking how they want to grow into their new home. Those answers don’t come by asking, “How big a house do you want? How many rooms should it have, and do you want an open floor plan?” Rather, he’ll ask if they have adult kids whose families will need space to stay, so summer may be more like coming home for them than going on vacation. Do they have aging parents they eventually could take in who will need an accessible bathroom—but one that’s aesthetically consistent with the original construction, not a renovation? He also asks how do they live? What are their hobbies? Is exercise important for them? Do they play cards? Does their daughter take ballet? Sciarretta meets clients in their current home to see how they live because photos of what they think they like don’t tell the whole story. During one visit, he observed a father and son sitting on the floor playing chess. While touring the children’s bedrooms with another client, he saw playing cards spread out on the edge of a bed as the mom lamented that the family rarely finishes a game because when they take a break for dinner and leave, the cards are disheveled upon their return. How fantastic an opportunity if a room, a niche, or even an alcove could be dedicated to space accommodating those activities. For the father-and-son chess players, Sciarretta had the architect design a space—with chairs—around the dimensions of a chess board. He accommodated the card and game players by extending out from the family room to add a niche that otherwise would have been a continuation of the exterior wall with windows. Tim Hensley has been building for 33 years and finds that he spends more time today setting client expectations about the project and how both parties will communicate. The president of Hensley Custom Building Group, in Loveland, Ohio, explains up-front that questions and other requests will receive a response within 24 hours. That means a reply won’t always be instantaneous, except in case of an emergency, and will occur during business hours, not at night. Hensley employees will update clients on schedule changes due to weather, selections delays, and subcontractor availability. To align product expectations with budget, Hensley shows prospects photos of finished homes, including such details as imperfections in drywall, so he can point to and illustrate the different levels of finishes available by price point. “If you’re delivering one level and the client is expecting another, then somewhere in the preliminary planning or the selections process, you didn’t give the right explanation or make the right promises. That’s one of the things that can lead to disagreements. Setting these expectations up-front has helped,” Hensley says. Sometimes the vision of the dream house that clients have doesn’t match the reality of what the plan specs say they’re getting or what they intend to spend. Sciarretta recalibrates those expectations by “going back to the basics,” he says. By the third client meeting, he’ll invite the client to go for a drive, during which they’ll visit three Hemingway homes, all with equal quality of construction but with different levels of finishes. As clients see each house, Sciarretta introduces them to the homeowner and then steps outside so the customers can have a private conversation and ask the owner about what it was like to have Hemingway Construction as the builder. 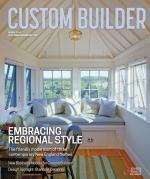 All of the builders interviewed for this article say they strive to meet with clients at least weekly so they can show the home’s progress. These sessions are opportunities to answer questions and keep clients excited about their project. They’re also often the time when clients see something they don’t like and want it changed, such as getting a different foyer window instead of the one specified in the plan and already installed. In such cases, Ricci will immediately submit the order for their signature. “If they change it on Monday, the clients get that change order Monday afternoon, and we need a decision no later than Tuesday,” Ricci says. “We like to get paid for the COs as they take place. We don’t tally that up and collect it at the very end. Change order requests are also an opportunity to educate. If a client wants a knee wall that’s not in the original plan and thinks the change is a small $1,000 framing and finish job, DeRosa sees his role as explaining all that’s involved: buying and installing casing, trim, and a decorative cap, and bringing in a framer, drywaller, painter, and an electrician because code requires an outlet— ultimately showing why the order costs $5,000. If a client contracts for 5/8-inch drywall with four coats of finish but then demands walls that feel like glass, Ricci will remind the client of what the contract says but will give a little and perhaps offer to do four rooms on the first floor with Venetian plaster at a 10 percent discount. Comments on: "Syncing Great Expectations"